Page revised in February 2016. Links to this page can be found in Book 7, Day 2 and Rione Monti. 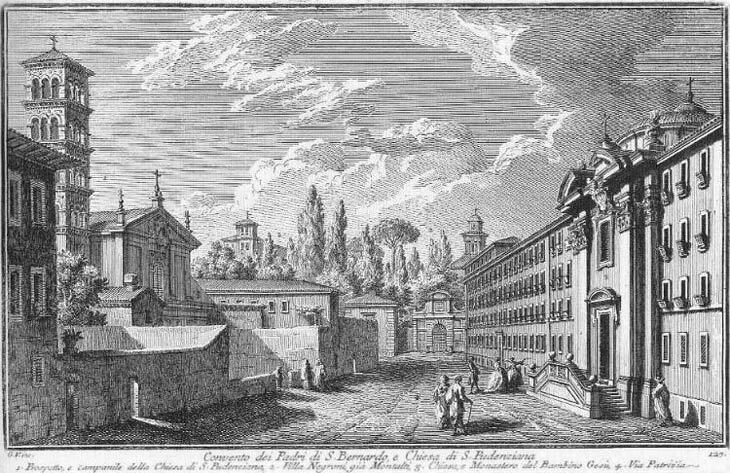 Occasionally the heading given by Vasi to his etchings may mislead the viewer; the long building on the right side of the plate is a nunnery, whereas the friary of S. Bernardo is the unassuming house behind S. Pudenziana. The branch of the Cistercian order which was named after St. Bernard of Clairvaux had its main friary at S. Bernardo alle Terme. The plate also shows some details of Villa Negroni (aka Villa Peretti or Montalto): the gate at the end of the street was known as Portone Viminale and the building of which Vasi shows only the tip was Palazzetto Montalto; they were both designed by Domenico Fontana for Pope Sixtus V at the end of the XVIth century. Fontana raised the level of the street in order to facilitate the access to the villa, thus partially "burying" S. Pudenziana (the opposite nunnery was built at a later time). The view is taken from the green dot in the 1748 map below. 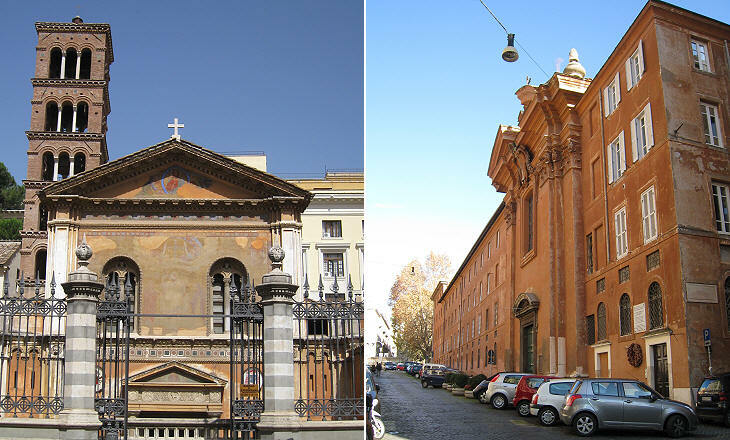 In the description below the plate Vasi made reference to: 1) Façade and bell tower of S. Pudenziana; 2) Villa Negroni; 3) Church and nunnery of Bambin Gesù; 4) Via Patrizia. The name of this street was already Via Urbana (with reference to Pope Urban VIII) at Vasi's time, but he preferred to use an older name of Latin origin Vicus Patricius, which meant that the patricians (the members of the noble class in ancient Rome) had their houses along this street. 2) is shown in more detail in another page. The level of the street was raised to a higher level again in the late XIXth century and now there are no longer steps leading to Chiesa del Bambin Gesù and S. Pudenziana is almost in a hole: the façade of this church shown in the plate was designed in 1585-599 by Francesco da Volterra (you may wish to see how it appeared in a 1588 Guide to Rome); in 1870 it was entirely replaced by a new one. Villa Negroni does not exist any longer and the street continues until it reaches the large square in front of Stazione Termini, the Central Railway Station of Rome. According to tradition Pudente, a Roman senator (converted by St. Paul) gave hospitality to St. Peter and turned part of his house into an oratory where Christians met to pray. A church replaced the oratory in the late IVth century and a century later its apse was decorated with a very fine mosaic. 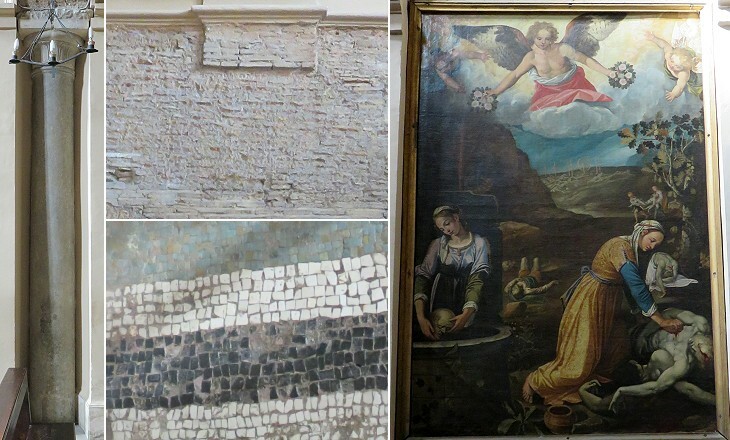 Archaeological research indicates that the church was built by modifying a hall of the private baths (Terme di Novato) of a late IInd century Roman house. The three naves of the church were separated by rows of columns which in the VIIIth century were incorporated into walls to strengthen the building. Archaeologists have identified the location of ancient baths beneath the apse. They have also cleared some parts of the church walls and floor from later additions to show their original aspect. Pudenziana and her sister Prassede (to whom a larger church was dedicated not far away and whose name means she who acts well) were venerated for their piety, but the accounts about their lives and martyrdoms in the second half of the IInd century do not match with historical evidence concerning Emperors Antoninus Pius and Marcus Aurelius. 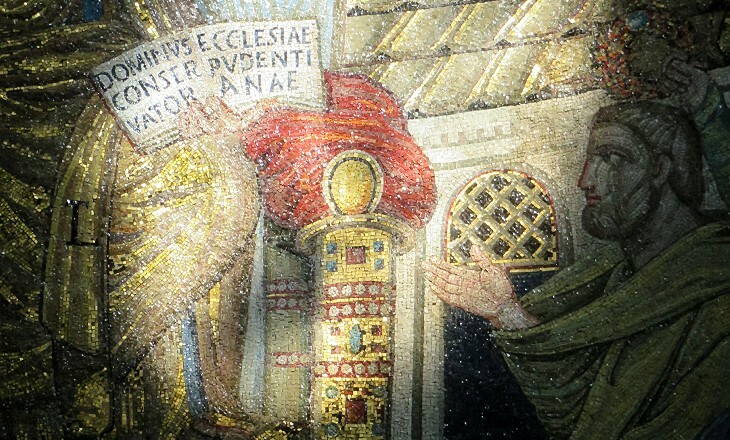 The word Pudentianae in the mosaic inscription most likely meant of Pudente, but its meaning was misinterpreted as of Pudenziana during the Middle Ages and the hagiography of the two daughters of Pudente originated from that mistake. The portal is dated XIth century a very difficult period in the history of Rome during which not many initiatives were taken for the maintenance and embellishment of churches. The Romanesque bell tower was added in the XIIIth century or slightly earlier. 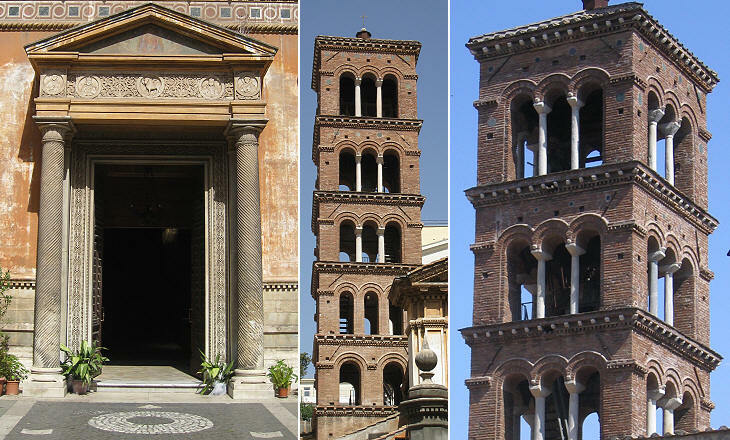 It follows the pattern of many other Roman bell towers which you can see in a page dedicated to this type of buildings. The medieval church was largely modified in the XVIth century and again during the 1870s by Cardinal Lucien Bonaparte; this led to some retouching of the medieval decoration of the door (which you can see in the image used as background of this page) and of the lintel; the five circular reliefs are among the finest examples of medieval sculpture in Rome; the two female saints are portrayed with a crown, rather than a halo; most likely also the two male saints wore a crown which was removed in the XVIth century. Pastore in Italian means shepherd and the reference to St. Pastore is the result of the corruption of an earlier name of the building, i.e. Oratorio del Santo Pastore, a reference to Jesus as the Good Shepherd. 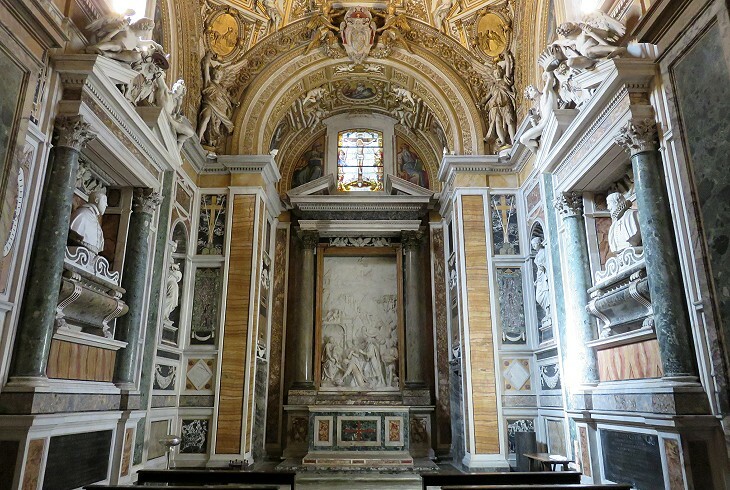 A medieval oratory was replaced by a chapel commissioned by Cardinal Enrico Caetani in the late XVIth century. 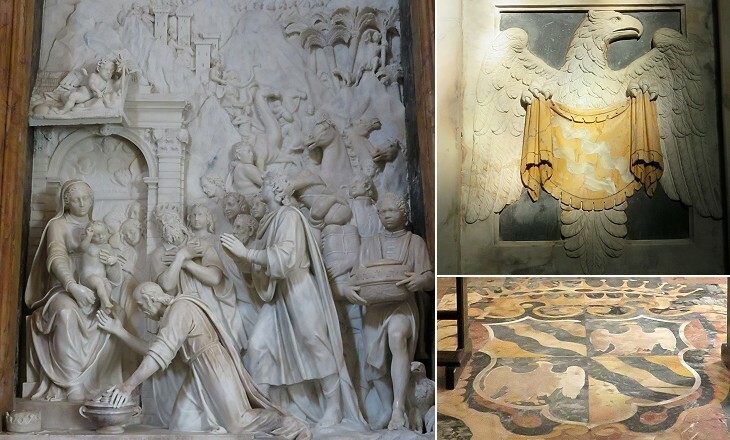 It was designed by Francesco Capriani da Volterra and completed by Carlo Maderno. Cardinal Caetani belonged to a once very powerful Roman family. The Caetani reached the peak of their might in the late XIIIth century with Pope Boniface VIII (Cardinal Benedetto Caetani). The chapel was built in the period between the construction of Cappella Sistina and that of Cappella Paolina in S. Maria Maggiore. It cannot compete in size with those chapels, but its decoration is as lavish as that of its larger sisters. It reflects the horror vacui (fear of empty spaces) which characterized the architecture of the second half of the XVIth century. A puteal (wheel-head) in a lost chapel and now near Cappella Caetani is said to have been used by the two saints to collect the blood of the martyrs which they gathered with a sponge. 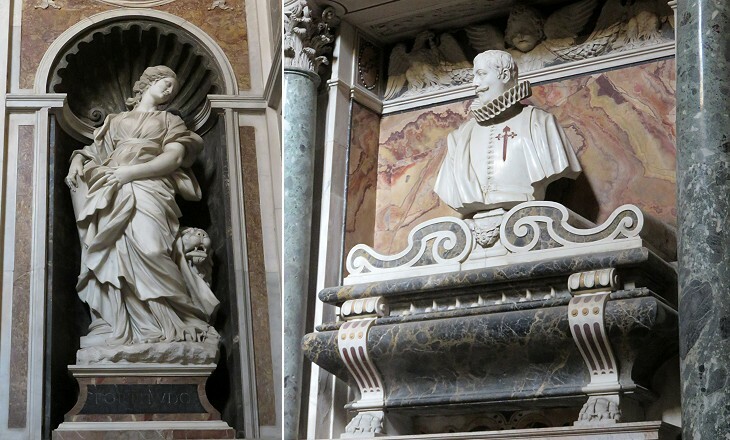 Because of its reduced size Cappella Caetani allows a better appreciation of its decoration and in particular of some sculptures by artists who, similar to Camillo Mariani, were involved in the decoration of Cappella Paolina, but whose works there are "lost" among too many others. Cappella Caetani houses an early example of the marble reliefs which became very popular as altarpieces during the XVIIth century. In his work Pietro Paolo Olivieri followed a traditional pattern established by Renaissance Florentine sculptors. He depicted the persons in the central scene using a very high relief whereas the retinue of the Magi was depicted using stiacciato, a very low relief. You may wish to see some Baroque altarpieces where this pattern was not followed. 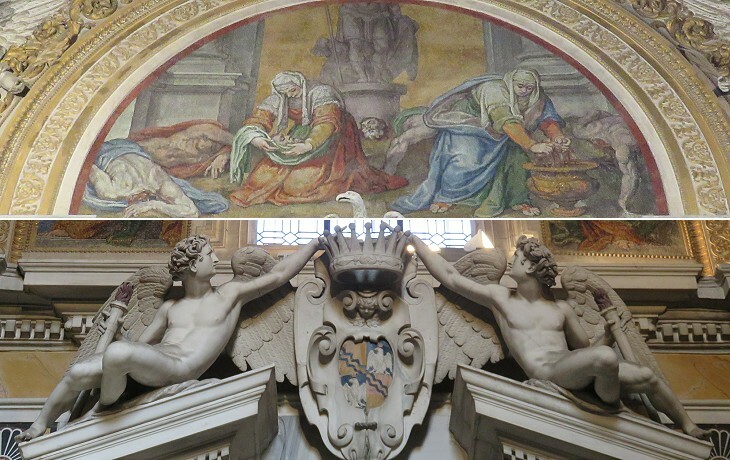 Francesco Caetani, Duke of Sermoneta and Spanish Viceroy of Naples, completed the decoration of the chapel in ca. 1668 by commissioning some statues to sculptors who belonged to the circle of Gian Lorenzo Bernini. You may wish to see the Caetani Castle at Ninfa, near Sermoneta. 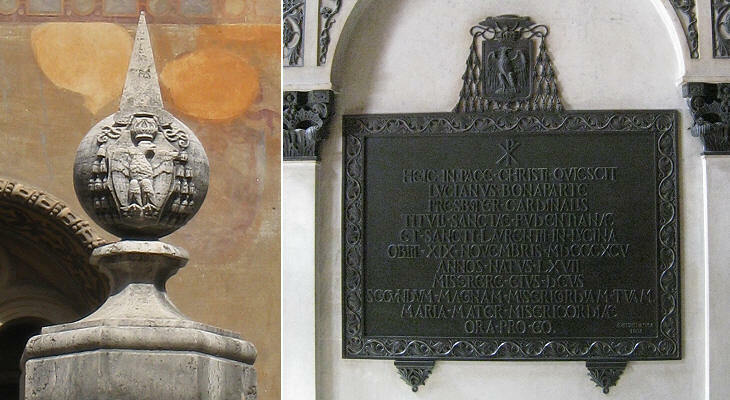 The globes at the XIXth century street entrance to S. Pudenziana show a coat of arms with a royal crown inside a cardinal's hat; a similar coat of arms was adopted by Henry Benedict, Cardinal of York, the last of the Stuarts (King Henry IX). This coat of arms belongs to Lucien-Louis-Joseph-Napoléon Bonaparte, Prince of Canino and grandson of Lucien Bonaparte, a brother of Emperor Napoleon I. He was appointed cardinal in 1868, at a time when Pope Pius IX relied on the support of his cousin and godfather Emperor Napoleon III for defending the Papal State. Cardinal Bonaparte died in 1895 and was buried in the church. In XVIIth century Rome the access to schools was reserved to boys; girls received their education at home and only the wealthiest families were in a position to have a private tutor; in 1671 Congregazione del SS. Bambin Gesù, a congregation aiming at providing some basic education to girls was founded; at the beginning its premises were near Tor Margana, but the success of the initiative led to the construction of a large nunnery/school which included a church. Initially Alessandro Specchi, the architect of Porto di Ripetta was asked to design the new buildings, but his projects were too expensive and the commission was assigned to Carlo Buratti (who designed the Cathedral of Albano); at his death in 1734, Ferdinando Fuga was asked to complete the church. Next plate in Book 7: Chiesa di S. Prassede. Next step in Day 2 itinerary: Villa Negroni già Peretti. 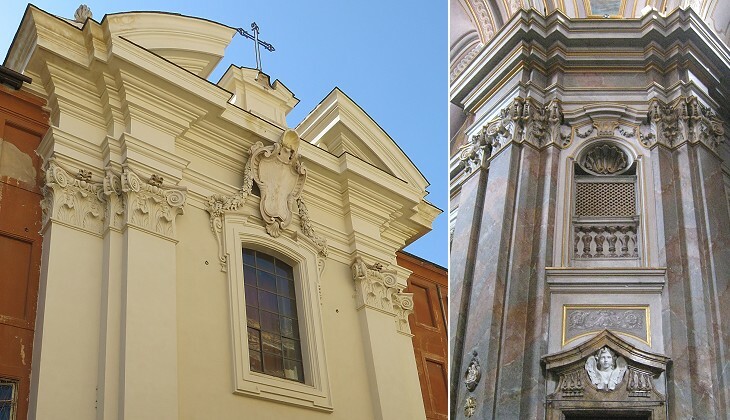 Next step in your tour of Rione Monti: Chiesa di S. Maria Maggiore. Da s. Pio I. fu eretta questa chiesa nella casa di s. Pudente Senatore Romano padre della santa Titolare, per essere stato in essa ricevuto il Principe degli Apostoli, e trattenuto molto tempo, essendovi tradizione, che ancora vi abbia celebrato i divini Misterj; come se ne conserva la memoria in una cappella al medesimo Santo dedicata. Più volte è stata ristaurata la chiesa da Sommi Pontefici, e Cardinali Titolari; l'ultima ristaurazione però fu fatta l'anno 1598. dal Card Enrico Gaetani, il quale fecevi ancora la nobilissima cappella di s. Pastore, con disegno di Francesco da Volterra: il bassorilievo sull' altare è opera di Pietro Paolo Olivieri, terminato però dal Mariani Vicentino; la prima statua a destra è di un allievo del Guidi; quella, che siegue, d'Adamo Lorenese, l'altra è di Francesco Mari; e l'ultima di Carlo Malvasia; gli Angioli sono de' medesimi, e li mosaici nella volta, li condusse Paolo Rosetti da' cartoni di Federigo Zuccheri; il quadro di s. Pudenziana, e s. Prassede, che danno sepoltura ai santi Martiri, è opera creduta del Ciampelli, ed il pozzo è quello, in cui la s. Titolare pose il sangue di tre mila martiri, che colle spugne raccoglieva nel vicino monte. La statua di Gesù Cristo, che dà le chiavi a s. Pietro nella cappella contigua, è opera fatta in marmo dal Cav. Gio: Batista della Porta, e le pitture nella volta sono del Cav. 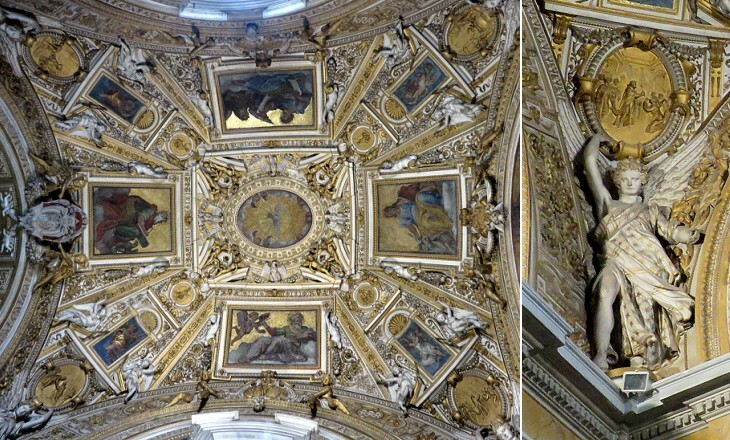 Baglioni; quelle però nell'altare maggiore sono di Niccolò Pomarancio, il quale fece ancora le pitture nelle cappelle, che sieguono, fuorché alcune istoriette a fresco nella cappella di s. Pudente, le quali sono del Nucci. Sisto V. la concedè ai monaci di s. Bernardo, i quali abitano nel monastero contiguo. Incontro alla divisata chiesa è quello monastero colla chiesa eretta dal Pontefice Clemente XII. con disegno del Cav. Fuga, nella quale si vedono de' quadri dipinti dal Cav. Benesiani. Queste religiose hanno per istituto particolare d'istruire le fanciulle a fare bene la prima Comunione, e a dare il comodo per gli esercizj spirituali a donne oneste, e civili.